The Australian Association of Islamic and Muslim Studies (AAIMS) is pleased to announce the winner for the Professor Riaz Hassan AAIMS Prize for Best Honours Thesis: Randa Rafiq for her thesis titled ‘The rocky road to legal pluralism’, which was submitted to the La Trobe University School of Law in 2018. AAIMS offers this prize for the most outstanding honours thesis in the interdisciplinary field of Islamic and Muslim studies, with the hope that this annual prize will serve to encourage junior scholars to pursue further research in the field. The award is named after Emeritus Professor Riaz Hassan OAM, who has been a foundational figure in studies of Muslim lives and has held positions of eminence at Flinders University, the National University of Singapore (NUS), Gadjah Mada University, University of California, Los Angeles (UCLA) and Yale University. An award ceremony will be held on April 11th at The University of Melbourne, where Randa Rafiq will be awarded a certificate of recognition for her thesis and a $500 prize for this significant achievement. 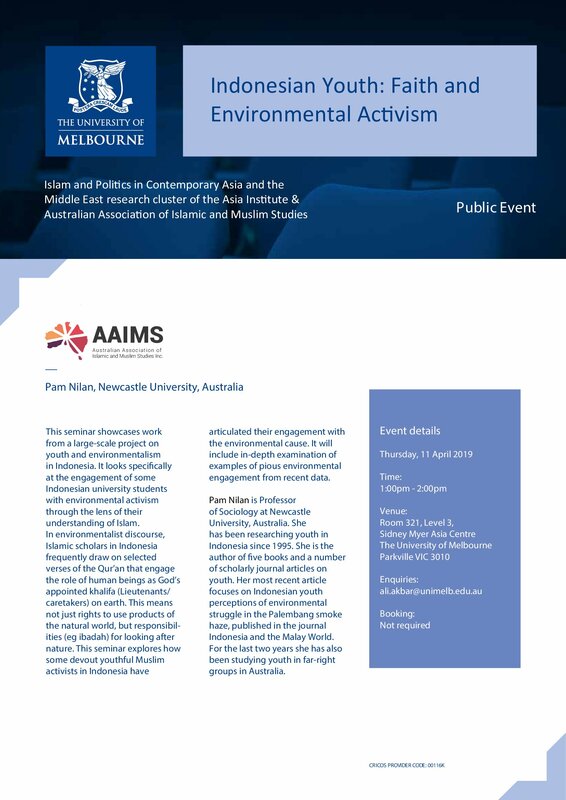 The ceremony will take place right after the exciting public seminar; Indonesian Youth: Faith and Environmental Activism by Professor Pam Nilan; from 1-2pm, in Room 321, Level 3, Sidney Myer Asia Centre. We look forward to Randa’s future contributions in the field of Islamic and Muslim Studies. Congratulations, Randa! For future updates on the ceremony, please follow the AAIMS website and twitter page @AAIMS_AU.